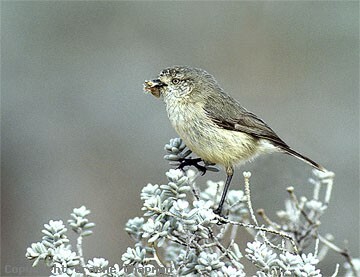 Samphire or Slender-billed Thornbills have a quite distinct habitat preference - low-growing chenopod shrublands, very often associated with saline flats, saltpans, salt lakes and coastal samphire. When breeding, they attend their nest in pairs but at other times small family parties wander the open shrublands. In all but the most arid regions, they are regarded as being resident and long distant movements have not been recorded. In most areas they can be found in the same places year after year. Locating them is one thing but detailed observations are not easy because they move quite quickly through that open habitat, and if disturbed they can easily fly several hundred metres before alighting. 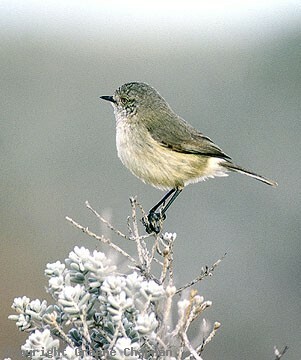 Samphire Thornbills range from western Victoria through to the coast of W.A. just south of Carnarvon. Their distribution is patchy and depends wholly on the presence of the low-growing shrubland they prefer - the Nullarbor Plain is one of the largest suitable areas. 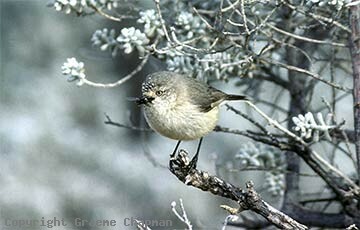 They resemble Buff-rumped Thornbills (the white eye is a clue) but unlike them, spend little time on the ground. 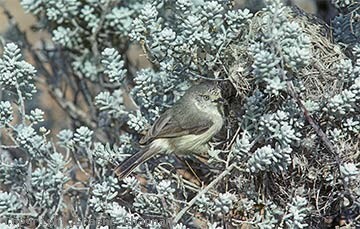 482201 ... Samphire (or Slender-billed) Thornbill approaching nest on Nullarbor Plain.